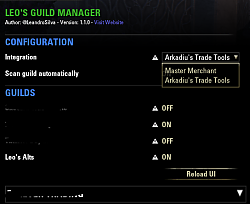 This Addons is intended to help manage a Guild. WARNING for version 1.1.0+: This is a complete rewrite of the add-on. So you need to complete the new settings the first time. I tested as much as i could and fixed everything i found, but i may have missed something, so PLEASE be careful, specially with mass demote/mass remove/Blacklist features! Type "/leogm" on your chat to open the main window or use the KeyBinding. 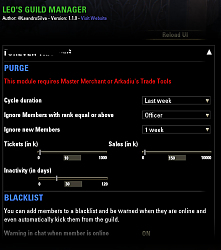 It uses MasterMerchant or ArkadiusTradeTools data to avoid scan the guild sales by itself. If you just installed them, wait for it do its first deep scan, then you can use this one. 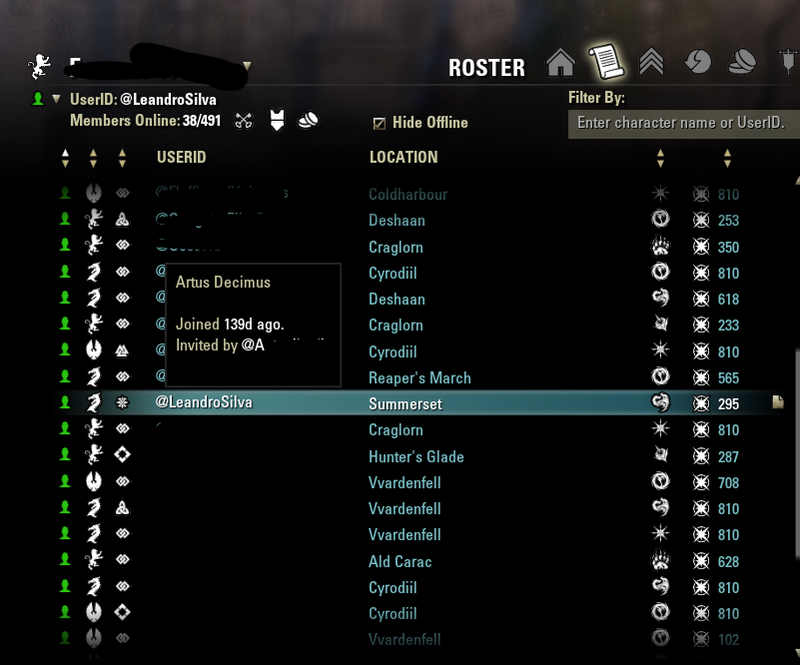 * Tooltip on guild roster with "time in guild" and "Invited by". More info to come soon. - Fixed lua error with usage of only MM. - Purge: Added Purchases to the list. Since MM does not record purchases, this feature works only for ATT for now. 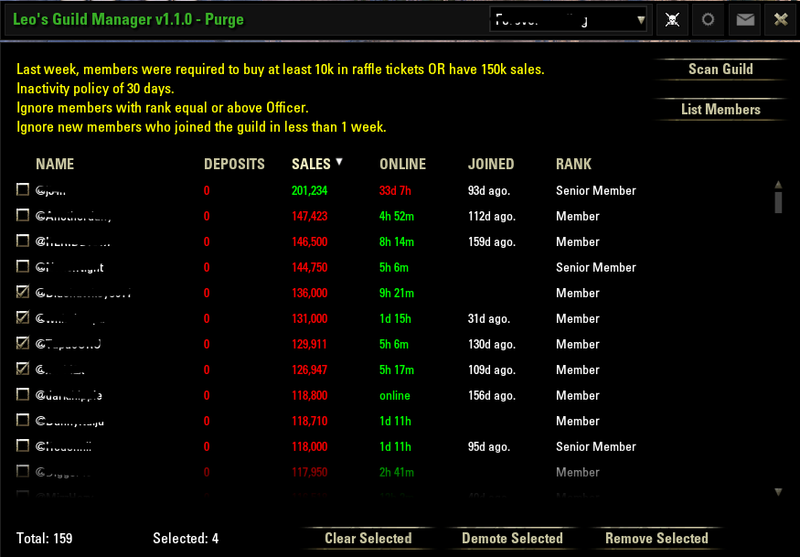 - You can use purge without permission from guild, will use only inactivity and, if available, sales data from MM or ATT. 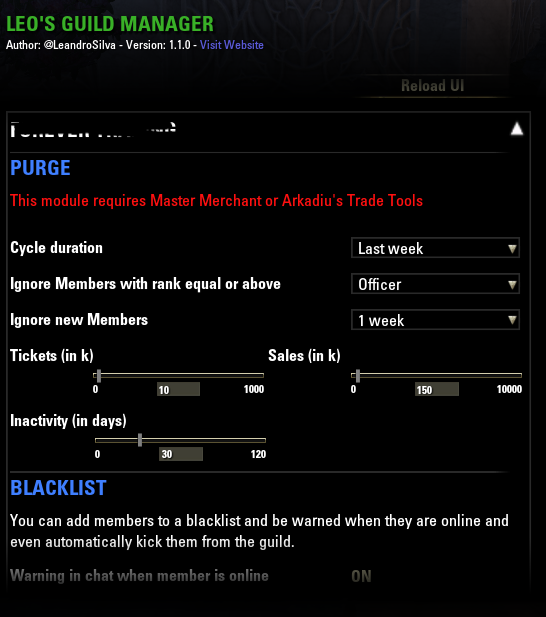 Fits well for non-trade guilds or those without weekly requirements. 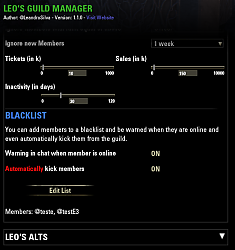 - Tooltip on guild roster with "time in guild" and "Invited by"
- Fixed the auto-kick and auto-demote from 0.9.3. Terribly sorry for that! - Disabled the scan until i fix the MM integration or scan by itself. 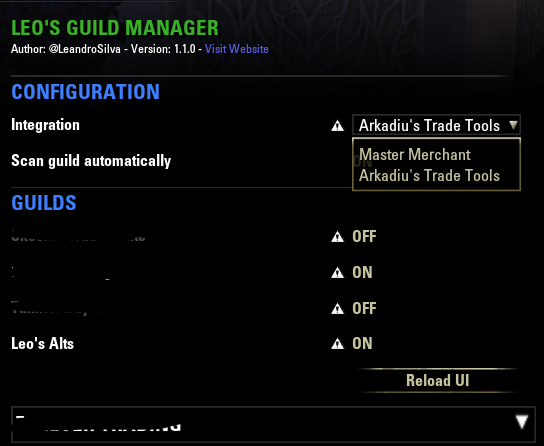 I can't get the options or addon to pull up by typing /leogm Can anyone help me? Thank you. Last edited by @King_Dean : 01/13/19 at 12:48 PM. 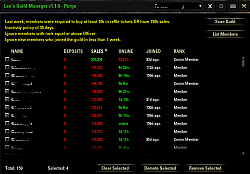 1 hour before the bid time end (at 7pm EST) listing for purge with "This Week" settings lists everybody with 0 gold deposits even tho deposits were made during the week. Last edited by refinicus : 11/25/18 at 06:30 PM. But MM has no parsed data for purchases, so i need to scan through MM data, but it's in the roadmap already. Yes, will add this feature soon too. Thanks. 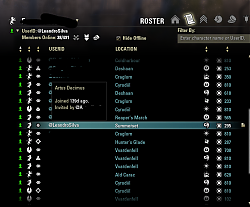 BTW if you could add join dates as tooltip the same way you added the sales that would be fantastic so i could forget Shissus and the guildroster ui once and for all. 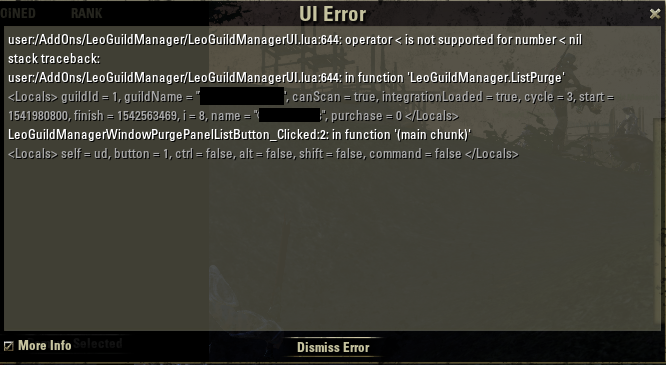 I use MM, and i guess thats the cause of the error. And a little thing again, the lowest rank members have the Demote option on right click just like everybody else, which is a little bit confusing. 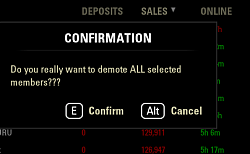 Any chance to change that to "Remove"? Of course with at least 5 new windows popping up with the question "Are you sure you wanna do that?" Thanks for the report, fixed on 1.1.7 . You're right, if a member is already on the last rank, it should not appear the option. Will fix it, thanks! The same for the other message. When running the purge on "last week" Time frame the list is full with people who fit the "ignore new members = 7 days" rule so these people shouldnt be on the list since they havent even been in the guild that week. Last edited by refinicus : 11/18/18 at 03:28 PM. Last edited by refinicus : 11/18/18 at 01:01 PM. Would there be anyway for us to import the data from your add-on into a spreadsheet? so we can just dump all the information so other people could view it if we wanted them to? Last edited by Ghost : 11/17/18 at 11:52 PM. Hi! You mean a guild member must buy at least 100k worth of items from his own guild store weekly? 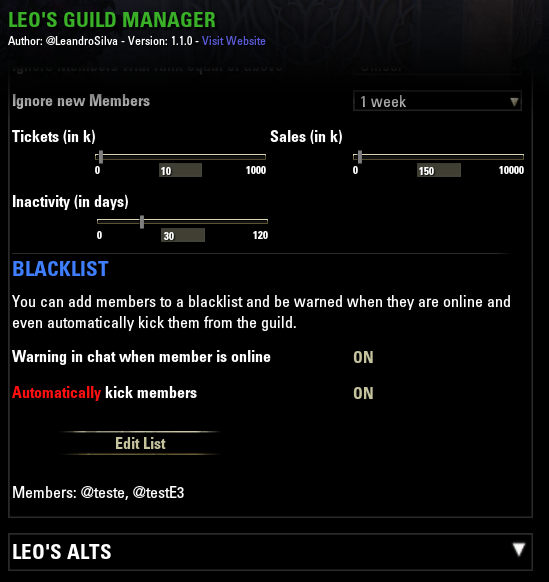 Yeah i think i requested this same thing back in september so yeah Leo please please, we also have this in my guild. Hi! Sorry for the delay. It's released with 1.1.5 . See if that fits your needs. Thanks!